This home requires Owner approval before we can confirm availability. Owner requires: Primary Guest must be a minimum of 25 years old. Lakefront, Private Beach, Buoy and Hot Tub, Internet. This lakefront sits right on the shore of Lake Tahoe, giving you unobstructed views from almost every room, a large deck, and an always welcome hot tub as an added benefit. The entry level offers a family room with large kitchen and dining area. A cozy seating area faces a rustic brick fire place (wood not provided) to enjoy on cool Tahoe evenings. There is a TV/DVD player and wet bar in this room as well. Exit the glass doors to the expansive deck, and get that much closer to "Big Blue". There is also a more formal living room, featuring the same fireplace, faced with beautiful river rock and spectacular views of the Lake. There are two bedrooms both with two single beds, one full bath with tub/shower, as well as a master suite on this floor. The master bedroom features a King size bed, private full bath, windows that look out at the Lake, and doors that open to the deck. 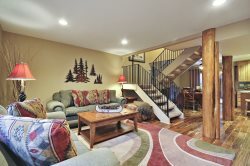 Descending the stairs to the lower level, there is one bedroom with two singles and a full bath and doorway that opens to the hot tub, grassy yard and the beach. Located on prestigious Edgewater Drive in Dollar Point this home has parking for 2-3 cars at street level. There are two flights of stairs down to the lawn, landscaped front yard and entry. This home belongs to the Dollar Point HOA which offers a pool, tennis court, playground, picnic areas, private beach, BBQ grill, and pier access (in the summer months). Please note there are 46 stairs down to the house from the parking area. We do not consider Service animals "pets"